PNNL’s expertise in energy storage research will help the state of Nevada meet requirements to investigate targets for utilities to implement energy storage systems. The Pacific Northwest National Laboratory and the Nevada Governor’s Office of Energy (GOE) have entered into a Memorandum of Understanding (MOU) to work together on energy storage research for the state of Nevada. PNNL, with support from DOE’s Office of Electricity Delivery and Energy Reliability (OE) Energy Storage Program, will help development and implementation of an energy storage study to meet the needs of Nevada State Bill 204. The bill requires the Public Utility Commission of Nevada (PUCN) to investigate and establish targets for electric utilities to purchase energy storage systems. The study will consider whether energy storage can be implemented cost-effectively while providing benefits such as improving the electric grid’s reliability, integrating renewable resources, and reducing greenhouse gas emissions. “These efforts offer an excellent opportunity for DOE to provide the advanced analytical capabilities housed at the national laboratories to support our states in making the best energy decisions possible,” said Imre Gyuk, Director of OE’s Energy Storage Research. Provide feedback on the scope of work outlined in the study. Assist in developing selection criteria to determine successful bids from energy storage providers. Assist GOE and PUCN directly with additional questions associated with request for proposals for energy storage systems. Review draft material prepared by the authors of the energy storage study, as requested. Cooperate with the GOE’s participation in any state regulatory docket that sets energy storage policies and rules. 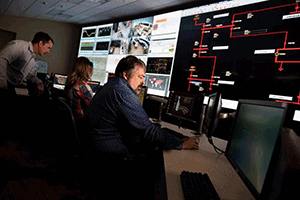 PNNL performs cutting-edge energy storage research under the DOE OE Energy Storage Program. This includes development of next-generation storage technologies for the grid, such as the vanadium redox-flow battery technology licensed to Washington state-based UniEnergy Technologies, as well as an extensive energy storage analytics program helping the nation’s utilities evaluate the technical benefits, performance, and control of energy storage systems. This MOU continues PNNL’s engagements to support collaborative DOE-regional energy storage efforts, following earlier agreements with Washington, Oregon, and National Grid. Those efforts have resulted in a framework for guiding systems-level analysis and proposals to deploy energy storage systems in Oregon as well as a policy statement in Washington to improve the regulatory treatment of energy storage. Learn more about PNNL’s Energy Storage.